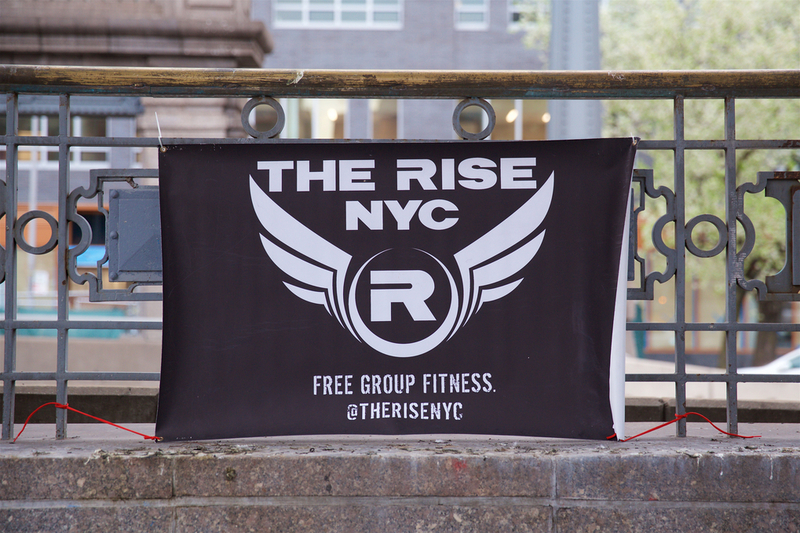 If you were looking for the perfect morning to get your exercise on in Union Square (and who isn’t?) then this was it. Cool air and no breeze. It felt like fall. We turned the boombox on and just as the ominous Union Square clock struck 0630000003017 the deck of cards flash mob workout began. It took newcomers Andrew and Ali all of two seconds to realize this was for real. And they were on it! Every card off the top of the deck was a new challenge. Black cards meant pushups. Red cards meant situps. It started with 9 pushups. The next card turned us over for 12 situps. Then 5 more situps. 14 pushups…. DONE! In less than fifteen minutes we had conquered the full deck of cards. All in all we did 208 situps and 208 pushups. We stood up, gave some high fives and hugs, and tried to catch our breath. The game wasn’t over, yet. The second half of this flash mob workout began with Patty who chose lunges. We flipped the top card off of a newly shuffled deck and it told us to do 4. So we did 4 lunges on each leg. Next up? Darron (sp?) chose high knees. The deck told us to do 8 of them. And round and round we went. Squats, burpees, jumping jacks, bicycle crunches. The most exciting exercise was the 3 short sprints from the trash can to the fence. Half of the thrill was just making sure you didn’t run into somebody when you turned around. And on we went until just like that it was over. We had been sweating for thirty solid minutes and just as we finished a set of Akil’s infamous plank punches we looked up and the clock read just past 0700000000013. That’s a wrap! Time for some more high fives, a quick group photo opp, and then we disappear. See you all on Friday for hill breakfast.